Samsung has just announced the mid-range Galaxy A9S and Galaxy A6S in China, but more interestingly it also used the event to tease the Samsung Galaxy A8S – a phone which based on the teaser image below (captured by SamMobile) has a truly all-screen design with no bezels and no notch. How could that be achieved? Well, one possibility is that it has a hole drilled into the screen for the front-facing camera. That’s a claim that was apparently put forward by leaker Ice Universe and they have a solid track record, however they’ve since deleted the tweet, suggesting they may not be confident of the information. Even if this is the case it just brings up more questions – would the camera lens always be visible on the screen (and if so is that any better than a notch?) or has Samsung found a way to build the camera in so that the display can appear on top of it. Certainly, there’s no visible camera hole in the teaser image. One thing the Samsung Galaxy A8S seemingly won’t have though is an in-screen fingerprint scanner, if leaker @OnLeaks is to be believed, so if there’s a fingerprint scanner at all it’s probably on the back. Of course it’s also possible that this teaser image isn’t representative. It wouldn’t be the first time a company has shown a not fully accurate image of an upcoming handset, and given that the phone appears to be translucent in the shot we’re wary about reading too much into any other part of the image. So there’s a chance the Galaxy A8S will have a bezel or notch after all. 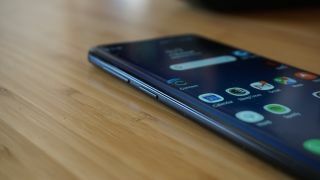 Even assuming that the Galaxy A8S is Samsung’s first phone with a truly all-screen design we wouldn’t get too excited, as you probably won’t be able to buy it outside China, but it could hint at what we’ll see from the Samsung Galaxy S10. We already know from Samsung itself that this phone is set to have a “very significant” makeover, and an all-screen design would certainly fit that description.